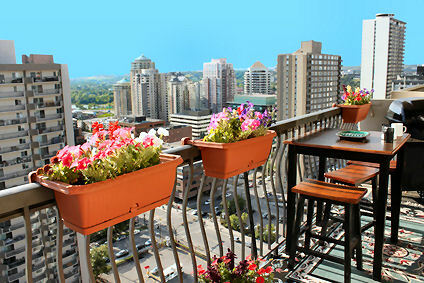 Balcony gardening with containers is the answer for those who live in an apartment, condominium or townhouse who still want to enjoy gardening. In fact, balcony gardeners have several advantages over other gardeners. You have more control over your gardening environment. Because you will use a potting soil with low soil content, it will be “clean” and free of disease or bugs. Also, if you live in a high rise, many flying insects won’t venture to your garden height. You won’t have to deal with nearly as much pest and disease control as other gardeners. Your plants are just steps away. This allows you to move them as needed during storms or an early frost. You can also water and groom your plants easily since they are nearby. Your garden can be enjoyed from inside your home. Usually, the only thing separating your garden from your indoor living area are windows so you can enjoy your garden all the time – not just when you are out of doors. You can enjoy growing flowers, shrubs and small trees, as well as vegetables, fruits and herbs from a balcony or terrace garden. There are a few things to consider before you begin your gardening efforts. Use vertical space for gardening too. What is your game plan? How large is the area you plan to use and how do you want to use it? Do you want to create privacy or an outdoor area where you can relax or entertain guests? Are you mainly interested in growing vegetables or herbs? Determine the “climate” of your garden area. Which way does it face – how much sunlight does it receive? Is it exposed to the elements or somewhat protected because it is recessed? It’s important to spend some time evaluating the balcony area because factors like sunlight, wind and shade make a big difference in what kind of plants you are able to grow. Consider the safety of the area. 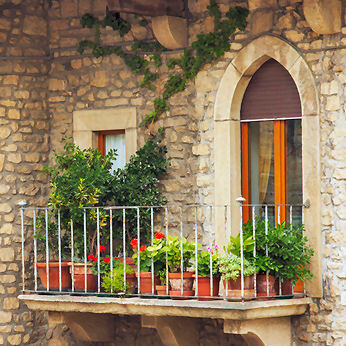 Most building codes require a balcony to be able to support 60 pounds per square foot. Check your area for specific weight guidelines. High winds, strong light and excessive heat and cold make harsh conditions for rooftop or high balcony gardens. Understand your sun and shade patterns and wind exposure before selecting plants. When it comes to balcony gardening with containers, there are a few special considerations to think about that don’t apply to all container gardeners. The most important are container selection, pollination, watering and the best use of space. Balcony gardening with containers made of plastic or fiberglass (shown to the right) are among your best material choices. They are lightweight and attractive. 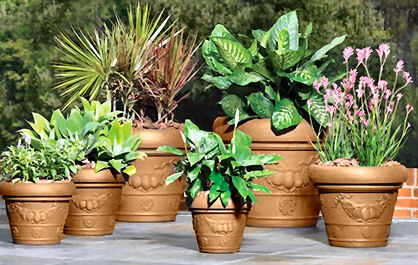 They also won’t crack like terracotta or ceramic if left outside in freezing temperatures. 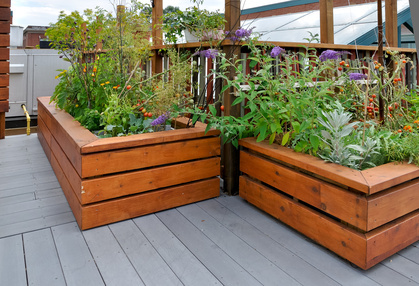 If you prefer wooden planters, choose cedar as it is also lightweight. Using a potting mix that has very little actual soil in it is another way to keep your pots or boxes light. Peat-based soils are the best. Where weight is a concern, use lightweight containers like these. Bees, beetles, moths and butterflies, will not be able to pollinate your plants since they probably won’t venture higher than a second story apartment. Pollination is important, especially if you are growing vegetables. If you live in a breezy location, wind pollination may be enough, if the blooms on your plants sway in the breeze. If you have little wind and no insects, you will need to hand-pollinate tomatoes, peppers, squash and cucumbers. Gently shake the cage or stakes of pepper and tomato plants every few days. Do the same with the other plants. Nothing else is necessary – you just need to stir up the pollen a little so it is transferred from the male part of the plant to the female. Hand-pollinate during the hot part of the day when the humidity is at its lowest. Peas, beans and lettuces are self pollinating and don’t need any help from their gardener. When choosing plants, their descriptions will indicate whether they are plants for full sun, partial sun or partial shade or sun. Full sun means at least 6 hours of sun per day. Partial sun requirements means 3 to 6 hours. Partial sun or shade receives filtered or dappled sunlight throughout the day. All container gardens require adequate watering – it doesn’t matter if they reside on a balcony in the city or in a backyard in rural America. But watering on a balcony can be an aggravation if you have a lot of pots to water and you have to carry water in cans or pitchers. Some practical advice for balcony gardening with containers is to purchase an apartment-sized hose – they are flexible and curl back up neatly when you’re through watering. They are definitely worth the small investment. 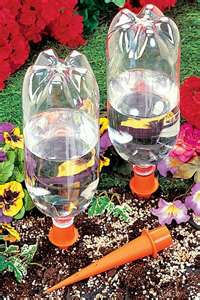 You can also set up your own slow-drip watering system. When balcony gardening with containers, find ways to use your space efficiently. You probably want to save floor space. Two ways to do this is by using tiered plant stands that display many plants in one small area, or to hang pots or boxes on railings. 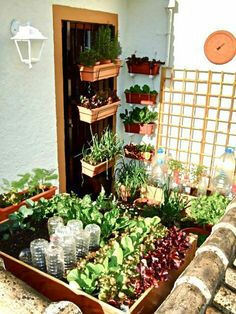 Use boxes that can be stacked when balcony gardening with containers used for growing edibles. Herbs and vegetables do great in these. Mix in an annual or two for extra color and it is an attractive display as well as a practical one. Create a corner to save space. If you like to grow vegetables, try planting them in rectangular or square boxes that will “corner” up easily and then hang flowering plants above them for decorative appeal. Save floor space – hang your gardens instead. 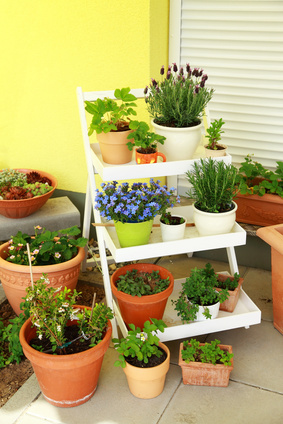 When balcony gardening with containers, make sure you make the most of all available space – not just the floor. Remember to use the vertical space too. Hanging baskets effectively use this space. According to Ace Hardware, concrete anchors that you would use for hanging containers should be rated for four times the weight of the container, and its contents, including water, soil and plants. 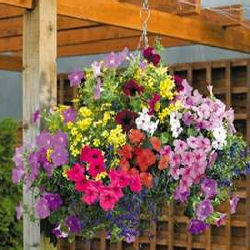 Many vegetables, as well as flowers, do great in hanging baskets. Vining plants like tomatoes, and strawberries shown to the right are a few. 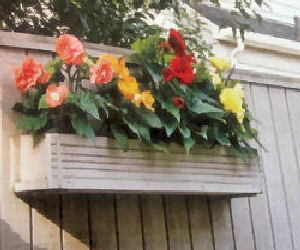 Hang baskets at heights that make them easy to water and maintain, or to provide privacy. Good use of wall space also uses your vertical area. Boxes or planters hung on the walls as well as railings frees up floor space. You can also stack boxes and grow up, not out. If you have a large area of wall to cover, group several wall baskets together. This looks great, especially if they are planted with the same plants. Wall planters save valuable floor space. Balcony gardening with containers takes some planning. A good idea is to sketch out your balcony garden area and plan for container placement before you shop for containers and plants. Decide where you want to place any outdoor furniture, and determine how much room you will have for your plants. Measure the floor area, wall area, any railing you may be able to attach to, etc. Determine how much area you need for comfortable outdoor dining or seating if that is a consideration. Depending on what you want to grow, use 5-gallon containers for vegetables such as tomatoes, cucumbers and cabbage, dwarf trees and shrubs, large perennials or climbing plants. Smaller vegetables such as peppers, beets and carrots will do fine in 2-gallon pots. Herbs can be planted in individual pots, or grouped together in a planter. Annual flowers can be planted just about anywhere – their roots don’t need deep soil. Figure out how many containers you will need and decide ahead of time where you will place them. You’ll know before you shop for containers or plants what you can accommodate and you won’t come home with containers, soil or plants that you can’t use. 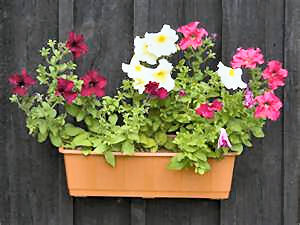 Place a plant that climbs or is upright against a wall or trellis. It is going to be the focal point for your container garden so make sure it is your tallest plant. Ornamental grasses are nice, as are climbing plants like clematis. 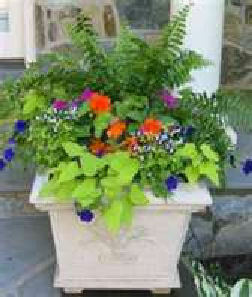 In front of your focal plant, fill in the bulk of your container with medim-height plants that are compact or bushy. Finally, around the edge of your container, plant vines that trail over the edge. Balcony gardening with containers is an easy way to create a privacy screen. Find out how to make one and some good plants to choose. 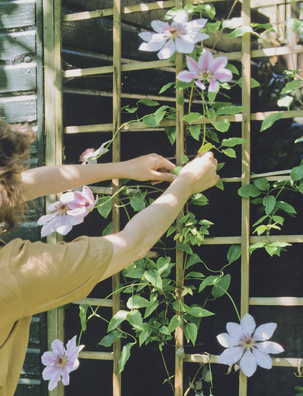 Create a privacy screen with plants that will climb and vine.